CAUTION: Jumping from one vehicle to another can be very dangerous and should only be done as a last resort or in an emergency situation. Never, ever jump your motorcycle from a running vehicle! A running car or trucks charging system may (probably will) argue with or overload your bikes charging system most certainly causing damage to your bikes electrical system. Over the years we have all become pretty complacent when using jumper cables as it is often a daily task in cold weather. Just because you may jump vehicles every day, doesn't mean the dangers are any different. So please, be very careful. Lay out your Parmidge JumpEZE jumper cable (make sure the positive and negative clamps are not touching). Remove the L/H chrome panel of your Cruiser and pull out the Parmidge JumpEZE plug. Slide both plugs together and push until they click and lock. Clamp the negative (BLACK) aligator clamp of the jumper to the negative post of the 12 volt jumper battery. Clamp the positive (RED) aligator clamp of the jumper to the positive post of the 12 volt jumper battery. If there is a large spark or "POP", STOP and recheck that you have the jumpers connected to the correct battery terminals! 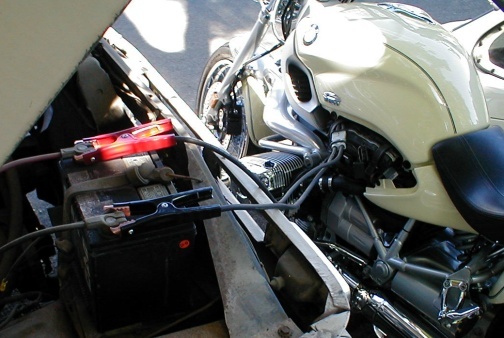 If the clamps are connected to what appears to be the correct sides of the battery but the positive still sparks, don't continue! There is a problem with the system of one or the other vehicle, this problem must be corrected. With both clamps connected to the jumper battery, turn on your Cruiser's ignition and check for ignition lights. If you have no lights, recheck the battery clamps and jumper plug. Press your Cruiser's start button. Crank the starter until the motorcycle starts or a maximum of 10 seconds. If your Cruiser doesn't start within 10 seconds, stop cranking the starter. Check the JumpEZE cables to see if they are getting hot. If the JumpEZE cables are getting hot, wait a few minutes before trying to start your Cruiser again. If your Cruiser doesn't start after several attempts, there is a problem elsewhere and you should stop trying. Continueing to try to start your Cruiser will only result in damage to the bike, the jumper vehicle, the jumper cables or yourself. As soon as your Cruiser starts, remove the cables from the jumper battery. When unplugging the JumpEZE plug from the motorcycle, pull on the plastic plug. Never pull on the wires as damage will result. Our Cruiser getting a jump from my old pick up.